Liquid organic fertilizer offers a natural solution for maintaining a healthy green lawn, organic vegetable gardens, chemical free flower gardens and high yield organic pastures. My search for a chemical-free fertilizer led to an easy-to-use liquid organic fertilizer that provides great results. I no longer have to worry about the dangers of chemical fertilizers to my children or dogs (at least not in my own yard). Have you ever gone to someone's house and they have just treated their lawn? You know it because you either see the flag from the lawn care company warning you not to go on it or you see all the little pellets in the yard and on the sidewalk and driveway. I don't know about you, but I have no desire to walk through that yard and I definitely don't want my kids rolling around in it. Most folks don't realize how dangerous the chemicals truly are. They figure a little bit every now and then to keep a nice looking lawn is not going to hurt anything. Guess what...besides being harmful when touched by humans and pets, those chemicals are getting into our water supply. Our natural fertilizer is formulated from fish emulsions from a single species of fish: the menhaden. Caught in the coastal waters of Virginia and the Gulf of Mexico, menhaden are not edible, but are used commercially for their high oil content. This ocean fish provides nitrogen, phosphorous and potatssium, essential nutrients for plant growth, along with a number of micronutrients, vitamins and amino acids. The fish emulsions are heated (not boiled) and concentrated to 50 percent solids. 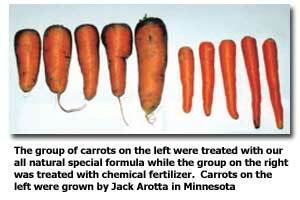 This results in a finished natural fertilizer base with the highest level of organic nitrogen possible (5 percent). 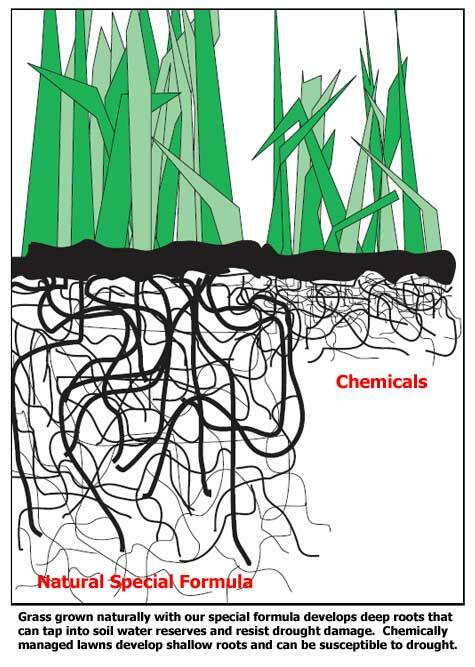 Molasses sugar produced from fresh cane provides carbon based nutrients for soil micro-organisms which recycle nutrients for plants. The addition of natural wintergreen oil improves the scent of of our Natural Fertilizer products. Bloodmeal provides additional nitrogen and organic matter for plant cell and microbial growth, leading to the creation of humus. Sulfate of potash from the Great Salt Lake in Utah in extremely fine grade provides more sulfur and potassium for improved fruit and seed quality and better cell-wall and stalk strength. This results in reduced susceptibility to insect attack, drought and disease. Kelp Extract gathered from the icy north Atlantic coast contains amino acids, micronutrients and potassium that help feed beneficial micro-organisms that enhance plant growth. Kelp also supplies plant growth hormones such as auxins and cytokinins that enable increased root and shoot growth. Increased microbial activity can produce digestive enzymes that attack and kill undesirable fungal pathogens. In addition, they compete for space, nutrients and water, leaving less room for bacteria that could potentially harm the plant. This results in plants with fewer diseases and better establishment of seedlings. When applied to foliage, the kelp in Natural Fertilizer induces a systemic acquired resistance in plants that results in enhanced photosynthesis. 2) Plant in hole up those leaves burying most of the stem. The buried stem will send out roots and this helps the plant produce earlier. 3) If soil is shallow then plant horizontally with the tip turned up gently. 1) Till in a layer of compost in fall or early spring (about 2 inches). Use a 2:1 soil/compost to fill holes when transplanting. 2) Mix two ounces of 4-3-3 tomato fertilizer with one gallon of water and soak the bottom of the hole before transplanting: right after transplanting water the plants with the same tea. 3) For the highest yields use tow ounces of 4-3-3 Fertilizer, two ounces of 0-12-0 bonemeal, and one ounce of 0-0-8 per gallon of water at planting. 4) Sprinkle with Fertilizer tea at first bloom, full bloom and during fruit set as cooler nights set in. 1st application: Band 3-4 oz. 4-3-3, 2-3 oz. 0-12-0, and 1-2 oz. 0-0-8 in 1 gal. of water on 10-20 ft. of row during planting. 2nd application: Foliar feed 2 weeks after emergence with 2-3 oz. 4-3-3 and 1-2 oz. Liquid Lime in 1 gal. of water. 3rd application: Repeat 2nd application 2 weeks later (for baby red potatoes use an additional application 4 weeks later). 4th application: Repeat foliar application 6 weeks after 3rd application. Soil application: Use 2-3 oz. 4-3-3, 2-3 oz. Liquid Lime, and 1-2 oz. 0-0-8 in 1 gal. of water on 10-15 ft. of row. 1st application: Band 1-2 oz. 4-3-3, 2-3 oz. 0-12-0, and 1-2 oz. 0-0-8 in 1 gal. of water on 20-30 ft. of row during planting. 2nd application: Foliar feed 1 week before 1st bloom (when terminal leaves are shiny) with 1-2 oz. 4-3-3 and 1-2 oz. 0-0-8 in 1 gal. of water. 3rd application: Repeat foliar feed before 2nd flush of blooms on string beans. Soil application: Use 1-2 oz. 4-3-3, 1-2 oz. 0-12-0, and 1-2 oz. 0-0-8 in 1 gal. of water on 15-20 ft. of row. 1st application: Broadcast 2-3 oz. 4-3-3, 2-3 oz. 0-12-0, and 1-2 oz. 0-0-8 in 1 gal. of water on 100 sq. ft. after planting. 2nd application: Foliar feed 4-6 weeks after emergence with 2 oz. 4-3-3 in 1 gal. of water. 3rd application: Repeat foliar application 3-4 weeks later. Soil applications: Use 2-3 oz. 4-3-3, 2-3 oz. Liquid Lime, and 1-2 oz. 0-0-8 in 1 gal. of water on 10-20 ft. of row or 30-100 sq. ft.
1st application: Broadcast 32 oz. 4-3-3 organic fertilizer with hose end sprayer on 5000 sq ft on first signs of growth in spring (after green up). 2nd application: Foliar feed 32 oz. 4-3-3 organic fertilizer with hose end sprayer on 5000 sq ft 4 weeks after first application. 3rd application: Repeat foliar application prior to summer dormancy of grass. 4th application: Repeat applications monthly in late summer after grass starts to grow again through the end of the season. Special spring enhancement: Use 1 pint of 0-0-8 and two pints of 0-0-12 per 5,000 sq. ft. on the early spring application for additional root development and drought resistance. Recycle nutrients to your yard with grass clippings. By using a mulching lawn mower you can return the grass clippings to increase soil biological activity. Adding natural nutrients such as fish emulsion, kelp, humates and corn gluten meal will stimulate microbial activity and the worms will love it. The organic fertilizer will slowly release the nutrients that the grasses need. You probably don't realize this but most of the chemicals applied in the US are applied to lawns for lawn care. Happy Americans in the pursuit of the perfect manicured lawns create over 90% of the toxic chemical pollution showing up in our drinking water and they end up with a weakened lawn to boot! That is why we are here. We are on a mission to educate folks that properly applied natural gardening and farming methods provide better results than industrial chemicals and are of course much safer. You can have a perfect green lawn that is also perfectly natural! That will in fact be more drought resistant and will be safe for kids pets and family to run around barefoot and roll around on. A natural lawn does a better job defending itself from pests and disease and does not require near as much water. Our special formula organic fertilizer is designed to create that perfect healthy lawn without toxins or poisons or nasty chemicals. We must do battle with the chemical companies that are profiting from the poisoning of our beautiful land and doing so by promoting the unnecessary use of their products. The world was a better place when small farms and small independent business were the norm and not the exception... Local family farms that create local food naturally are better for our economy and better for our health than the huge industrial agricultural machine. The reality is big business has taken over and pushed out the little guy and now, to add in insult to injury, they sent all the jobs to China and force feed cheapened food and products back too us through your local Wal Mart. My family and I eat beef, chicken, eggs, and raw milk from local farmers here in Kansas and Missouri who make a respectable living by providing me and my like minded friends with their farm fresh and natural products. Yes we are cutting Monsanto and Cargill out of our families personal food chain. No GMO seeds and no corporate feedlot beef and no abused and toxic chicken from crammed chicken houses. But all is not perfect in the land of "natural". Here is the problem with the natural fertilizer market... it seems everybody with some kind of animal waste stream that can be used as a form of fertilizer is trying to fill bags with their waste and cover the outside of the bag with pretty pictures of healthy plants and crops and with pretty promises of natural goodness pasted on them to make a healthy profit from their animals waste stream. While I admit it is generally a good idea to recycle these animal waste materials back to the earth... by themselves they are not a healthy and cost effective way to improve soil. They should be composted and blended and formulated and tested first to provide a balanced supplement to the soil under your plants. The problem is that by themselves they don't feed your soil everything it needs to develop for really prolific and healthy plants. A lot of these fertilizers just don't produce results that are worth the price. The label Natural or Organic Fertilizer does not automatically equal safe or effective for soil and plants. You can't just spread bat guano or chicken droppings or regular manure and get the same results you can from combining the right blend of properly processed fish and kelp and natural ingredients to really stimulate the soil and really boost plant growth. If you manage cattle on your land... then you should not fertilize pastures if you are not already using them for all they are worth. If you have livestock and you have not implemented some form of managed grazing (in its most simple form of rotate once a week) then you are not getting the most out of what you have right now so it is not time to spend a single penny. A couple hundred dollars for a portable spark wire and battery arrangement will return 10 fold in your first season. You should start there and I recommend reading "The Stockman's Grass Farmer" newsletter on a regular for continued development in the area of making a small farm profitable in a natural way. Yes, yes, your extension agent already told you how much nitrogen per acre you need to put down but step back for a minute, if you are not fully utilizing what grows already by using a tiny bit of managed grazing then why the heck are you going to grow more that you are not going to use. Worse yet... straight up NPK amendments are not going to improve your soil long term so please use everything you got now in a profitable way then scale up with soil amendments. The bottom line is I am on a mission to provide natural organic fertilizer products that really grow gardens, lawns, and pastures for the folks that count on every penny invested in their garden returning great results. Providing effective natural solutions will push toxic fertilizer chemicals out of our food chain once and for all. We also seek other earth friendly ways to reduce our footprint and live naturally and that is why we use synthetic motor oil to improve gas mileage in our vehicles, reduce the number of toxic oil changes, and extend the lives of our engines. The world will finally see through the toxic corporate smoke screen and rediscover that natural methods cost less and produce more as God intended. For more information on how to enjoy a beautiful lawn and vigorous plants, please feel free to contact me. Order your organic fertilizer directly online...retail or wholesale. Produce the best tomatoes with all natural organic tomato fertilizer. Compare organic fertilizer vs chemical fertilizer. You may be surprised which one costs less. Compare other components of each type of fertilizer. Keep your four-legged friends happy with a natural pet safe fertilizer. Converting to organic fertilizer from chemical fertilizer...what does it entail? Looking for a chemical-free option for grass fertilizer that doesn't cost a lot and gives you a stellar lawn? Discover the easy steps to natural lawn care. Liquid lime fertilizer is a great alternative to bagged lime fertilizer. Don't let your kids play in chemicals! Fertilizer naturally with a kid safe fertilizer that gives stellar results. Are lawn brown spots driving you crazy? Find out what you can do to green up your lawn again. Want your deer's antlers to explode? Discover how to prepare deer food plots using all natural liquid organic fertilizer. Natural Fertilizer 4-3-3 is a multi-purpose liquid product that is ideal for all- around use on flowers, vegetables, fruits, lawns, shrubs, trees and field crops. Liquid bonemeal increases soil fertility and plant nutrition. Find out what the fertilizer numbers mean and how to use them to increase your yield. Produce healthy, hearty plants through foliar feeding with natural organic fertilizer. Grow high-yielding luscious apples with natural organic apple tree fertilizer. All natural organic soil fertilizer will provide a premium environment for your plants and trees. Grow juicy, high yielding fruit using natural organic citrus tree fertilizer. All Natural Tree Fertilizer makes shrubs and trees more drought resistant. Are you looking for a blueberry fertilizer that is all natural and will help you grow luscious blueberries? Looking for an all natural corn fertilizer that will produce great yields for this demanding crop? From amaryllis bulb to blooming amaryllis flower...growing amaryllis naturally has never been easier. Find quick answers to some common questions regarding natural organic fertilizer. Use All Natural Liquid Organic Garlic Fertilizer to grow your garlic naturally. It is good for the environment and costs less than harmful chemical fertilizers. 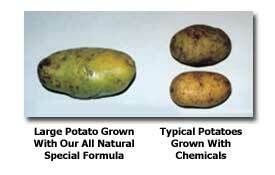 Looking for an organic option for potato fertilizer that will help with blight and bugs and increase your yield? 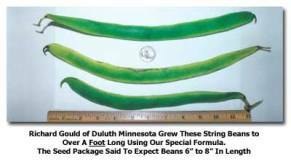 Beans will flourish with All Natural Liquid Organic Bean Fertilizer. Make more money at the Farmers Market with the help of Natural Organic Fertilizer. Use all natural cucumber fertilizer to produce hearty, great tasting cucumbers. Ever wonder if you could grow fresh, ripe raspberries? Secrets to Growing Pumpkins Naturally...How to Get Gigantic Pumpkins! Discover how to make compost in your own backyard and give your garden and plants the best nourishment...naturally. The benefits of worm compost and how to turn your garden into an oasis. Before you buy a compost tumbler check out these benefits and how to build a compost tumbler yourself! Fish Liquid Fertilizer: How Is It Made? Boost production and yield naturally with organic farm fertilizer. Find the best fertilizer for your specific lawn and garden applications. Use all natural organic pasture fertilizer to increase the number of hay bales and save you money!